The Austin Wranglers, the local arena football league team, is heading for the playoffs. After browsing the Pecan Street Festival, Doug and I went to the game, which was the last home game of the season. 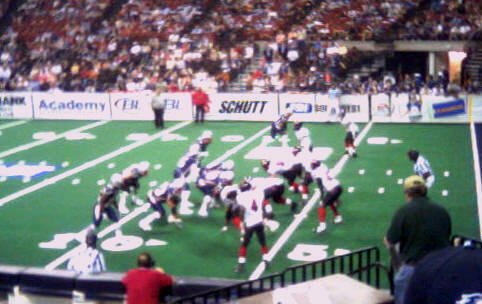 The Wranglers beat the Grand Rapids Rampage, 57-38. If you've never been to an arena game, it's quite fun. The field is about a quarter the size of a standard football field. There are only 7 players per side, with players playing both offense and defense. There are no sidelines, just boards (like hockey), so you get smashed up against the wall. Also, like hockey, there are a lot of fun and games for the fans, so of like a game show. The game moves fairly quickly -- we were out of there in two and a half hours. Thanks to Ross, one of my former students who interns with the Wranglers, we had great seats. The energy was high today and it was probably the loudest we've ever seen it at a game. We are seriously thinking about buying season tickets next year as they are two-thirds the price. The Wranglers have one more (away) game. If they win it, they will have home turf advantage. If we go to any of the playoff games, I will try to remember to take my digital camera so I will have a better photo than what my camera phone can provide. What European city I belong in. School's out, for the summer! We can't take you anywhere!